Bangladesh ended the second day of the first Test against Zimbabwe here today in a strong position to win their first Test match. England can look forward to this year's Ashes series with confidence despite suffering their first Test defeat for over a year this week, England fast bowler Darren Gough said today. South African allrounder Jacques Kallis has toppled India vice-captain Rahul Dravid to emerge as the first batsman from his country to occupy the top position in the latest PricewaterhouseCoopers rankings of Test cricketers. Pakistan captain Inzamam-ul-Haq has admitted feeling depressed after former captain Imran Khan described his leadership as “spineless”. Pakistan’s all-time second-leading Test run-scorer, the 34-year-old Inzamam made one and nought in the first test against Australia, then missed the next two matches with a back injury. Top seeds Carlos Moya and Paradorn Srichaphan stormed into the semi-finals of the ATP Chennai Open Tennis championship recording easy wins here tonight. While Spaniard Moya beat Paul-Henri Mathieu of France 6-4 6-4, Thai Srichaphan coasted to a 6-3, 6-4 win over Kristof Vliegen of Belgium. In the semifinals tomorrow, Moya will take on compatriot Guillermo Garcia-Lopen, who beat Czech Michal Tabara 6-4, 6-4 while second seed Srichaphan will clash against Czech Tomas Zib who got the better of American Justin Gimelstob 6-3, 7-6 (7/4). Indian tennis star, Leander Paes, today predicted that 2005 was going to be the "best" year in his career and he was course to win many ATP Tour and Grand Slam doubles title with his new partner, Nenad Zimonjic of Serbia. The Slovak Republic reached the final of the Hopman Cup mixed teams tennis tournament against Argentina here today, denying the USA any chance of a third straight win in the event. 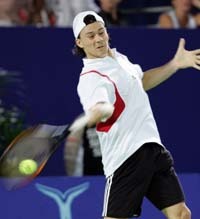 The third-seeded Slovaks scored a 3-0 walkover against the Netherlands after Peter Wessels was forced to forfeit his rubber against Dominik Hrbaty while trailing 5-2 in the first set. Sher-e-Jallandhar will take on Hyderabad Sultans in the opening match of the Premier Hockey League (PHL) Tier I, starting at the Gachhibowli Stadium in Hyderabad on January 13. Laying to rest all speculations, veteran striker Dhanraj Pillay today said he would play in the inaugural Premier Hockey League in Hyderabad and donate his earnings from the event to the tsunami-affected victims through the Prime Minister's Relief Fund. Former BCCI Treasurer and Rajasthan Cricket Association Secretary Kishore Rungta today got a breather when the Rajasthan High Court granted a status-quo order against the ad-hoc committee appointed by the state government. After Una, Dharamsala, Mandi and Chamba, now it is the turn of Nadaun town of Hamirpur district to be on the national cricket map. The lush green Amtar ground of the town will be a venue for five one-dayer Ranji Trophy matches that will start here from January 9. The Punjab Sports Department will revive the Maharaja Ranjit Singh Award from this year. Capt Amarinder Singh, Chief Minister, Punjab, has already approved it and about 100 sportspersons will be honoured soon. The award money has been increased from Rs 25,000 to Rs 1 lakh. Gaganjeet Bhullar clinched the Royal Challenge Western India amateur title by a convincing six strokes margin with a final day performance of three-over 73 at the par-70 Bombay Presidency Golf Course. Top-seeded Grandmaster Krishnan Sasikiran snatched the lead as a sweet birthday gift when he defeated team-mate International Master RR Laxman in the seventh round to log 6.5 points in the third Parsvnath International Chess Tournament at the Bapu Samaj Seva Kendra here today. Half a point behind him were Abhijit Kunte, Enamul Hossain, Deep Sengupta and S Satyapragyan. Himachal Pradesh will play its first match against Uttar Pradesh on January 28 in the 41st Under-19 National Football Championship (North Zone), which is being organised by the Uttar Pradesh Football Association at Basti in Uttar Pradesh. The International Cricket Council (ICC) today said the World Cricket Tsunami Appeal matches would have official one-day international status. ICC President Ehsan Mani said the decision was confirmed by a vote of the ICC Executive Board because of the exceptional nature of the matches in which players from all ICC full member countries are available to play. “The ICC board is of the view that due to the extraordinary circumstances that have brought about these two matches an exception to the existing rules should be made,” Mani said in a statement released here today. In the first of the two appeal games, ICC XI will take on the Asian XI at the Melbourne Cricket Ground on Monday while the second match would be held in Asia some time next month. The proceeds from the match will be donated to the global relief and development organisation World Vision. The Melbourne match would be broadcasted in as many as 122 countries across the globe, the ICC said. The match would be available to television viewers in countries throughout Africa, Asia, Asia Pacific, the Caribbean, the Middle East, North America and Europe, ICC Chief Executive Malcolm Speed said in a statement. Meanwhile, the ICC announced that Pakistan all-rounder Abdul Razzak would replace injured paceman Shoaib Akhtar, who was forced to withdraw because of a hamstring injury, in the Asian XI. The ICC said the Asian XI would appear in green uniforms with gold trim during the day-nighter, while the Rest of the World would wear navy blue with white stripes. South African Rudi Koertzen and New Zealand’s Billy Bowden would be the on-field umpires, with England’s Chris Broad acting as the match referee. Bob Parry would be the TV umpire, the statement said, adding that all umpires had waived their match fees for the two ties. Sydney: Australian cricket authorities on Friday declared the all-star tsunami relief charity match a sellout. Cricket Australia chief executive James Sutherland said no more tickets were available to the public at next Monday’s match. “To sell approximately 56,000 tickets in just three days is an amazing effort ... we’re certainly hoping to raise several million dollars for the tsunami appeal,” Sutherland said. He was confident that the remaining tickets at the 80,000 capacity ground, which are reserved for MCG members and their guests, would be snapped up over the weekend. Telecommunications company “3”, an Australian division of Hong Kong’s Hutchison Whampoa, said pledged to pay 1,000 dollars ($ 762) for every run scored in the match to the tsunami appeal. With around 300 runs per team realistics in the star-studded charity hit out, it could mean an extra $ 600,000 to the event’s total. England paceman Darren Gough said he was excited to be playing alongside some of his cricketing heroes for a worthy cause. Colombo: Sri Lankan off-spinner Muthiah Muralitharan on Friday confirmed he would take part in the all-star cricket fund-raising match in Australia. Muralitharan, who narrowly avoided the waves that devastated parts of his country, said he hadn’t fully recovered from a shoulder injury but the match was too important to miss. Muralitharan said the shoulder problem that had sidelined him since August was minor compared with the suffering caused in the tsunamis. The shoulder “is still not 100 per cent, it must be about 70-80 per cent. But it is very important to play since this is a charity match,” Muralitharan said. Muralitharan escaped the disaster only because he delayed by 20 minutes his trip to Galle, in the south of Sri Lanka, for an award presentation ceremony, his manager Kushil Gunasekera said. Muralitharan, an ambassador with World Food Programme, has been working in tsunami-affected areas and is among the Sri Lankan players who have launched their own relief fund-raising campaign in association with the national cricket board. Bangladesh ended the second day of the first Test against Zimbabwe here today in a strong position to win their first Test match. Bangladesh, who have lost 31 of their previous 34 Tests, were bowled out for 488 — their highest score — just after tea and then reduced the visitors to 84 for four at stumps. Zimbabwe, who have been severely weakened by a dispute between their board and several leading white players, are playing their first Test after an International Cricket Council (ICC) suspension of their Test programme ended on January 1. Allrounder Mohammad Rafique was the chief destroyer for the home side, bludgeoning six boundaries and four sixes in his 69 before he took two wickets in the final session. Rafique, who shared a blazing 62-run partnership with Mashrafe Mortaza (48) as Bangladesh’s batsmen plundered the inexperienced Zimbabwe attack in the afternoon, trapped Vusi Sibanda (12) and debutant Graeme Cremer (nought) lbw to leave the visitors in deep trouble. Zimbabwe, who need a further 205 runs to avoid the follow-on, began positively with opener Stuart Matsikenyeri smashing five boundaries in his 28 runs before he was caught by Bangladesh captain Habibul Bashar off Tapash Baisya with the score on 31. Sibanda was trapped in front by Rafique before Barney Rogers was run out unfortunately when a shot from Hamilton Masakadza was deflected by bowler Enamul Haque Jr on to the stumps. Masakadza was 28 not out while Brendan Taylor was on eight. FoW: 1-91, 2-93, 3-153, 4-272, 5-283, 6-341, 7-410, 8-472, 9-480. Bowling: Mpofu 29-3-109-4, Hondo 27-6-70-0, Chigumbura 28-6-79-1, Nkala 26-11-50-2, Cremer 16.3-1-86-2, Matsikenyeri 23-3-84-1. FoW: 1-31, 2-48, 3-59, 4-59. Gough, who retired from Test cricket in 2003 but remains in the national one-day squad, said England were gaining momentum for this year's five home tests against the top-ranked Australians. ''The players are playing their natural game,'' Gough told reporters in Melbourne, where he is preparing for Monday's tsunami charity game between a Rest of the World XI and an Asian XI. ''That's what we need before we play Australia. What we are getting now is momentum and selection is a lot better than it used to be,'' the 34-year-old Gough added. England won 11 of 13 Tests in 2004, drawing the other two. South Africa won the third Test against England in Cape Town this week to level their five-match series at 1-1. Australia have won the past eight Ashes series. Gough, who took 229 wickets in 58 Tests, wore a rueful grin as he recalled the first of his four Ashes campaigns in 1994-95. ''I genuinely believed we could beat Australia. Obviously after being 3-0 down, I realised that we couldn't. It's very difficult,'' he said. Gough said key members of Michael Vaughan's current England side, like all-rounder Andrew Flintoff and fast bowler Steve Harmison had the advantage of not experiencing several Ashes defeats. ''We have players now who are at the top of their game. They are all up for it,'' Gough said. ''Everybody wants to do it. When England win the Ashes again, I will be there at the ground, I'll guarantee it. While Dravid has been pushed to the No 2 spot, the Indian duo of Virender Sehwag and his opening partner in one-dayers Sachin Tendulkar occupy the sixth and seventh places, respectively. Top 10 batsmen: 1. Jacques Kallis; 2. Rahul Dravid; 3. Ricky Ponting; 4. Brian Lara; 5. 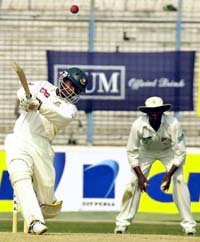 Damien Martyn; 6. Virender Sehwag; 7. Sachin Tendulkar; 8. Matthew Hayden; 9. Kumar Sangakkara; 10. Adam Gilchrist. Australia won the third test by nine wickets in Sydney this week to sweep the series. “I’m definitely depressed but hopefully I will perform well in the one-day series,” Inzamam told reporters. Pakistan coach Bob Woolmer said Imran’s description of his team as “spineless” was incorrect. Imran told a Melbourne radio station on Thursday: “What I think is disappointing is the spineless manner in which they have played, the lack of fighting qualities, no leadership, no plans. “It’s the mis-match that has been greatly disappointing. People expected a bit more of a fight. “Perhaps he (Inzamam) should have played the last test because, with a back injury, I can understand a fast bowler missing out, but a batsman missing out I think is disappointing,” added Pakistan’s 1992 World Cup-winning captain who played 88 tests. Top seeds Carlos Moya and Paradorn Srichaphan stormed into the semi-finals of the ATP Chennai Open Tennis championship recording easy wins here tonight. While Spaniard Moya beat Paul-Henri Mathieu of France 6-4 6-4, Thai Srichaphan coasted to a 6-3, 6-4 win over Kristof Vliegen of Belgium. In the semifinals tomorrow, Moya will take on compatriot Guillermo Garcia-Lopen, who beat Czech Michal Tabara 6-4, 6-4 while second seed Srichaphan will clash against Czech Tomas Zib who got the better of American Justin Gimelstob 6-3, 7-6 (7/4). Both Moya and Srichaphan seem to be heading for a repeat of last year's final going by the performances of other players. Moya grew in confidence after an initial break to beat the best of Mathieu while Srichaphan scored a confident win over Vilegen while Lopez ousted former champion Tabara. After claiming the first set rather easily, Zib encountered resistance from his rival, who quite often rushed upfront but was rarely successful. Zib called the shots most often in the second set too, but the never yielding American found his way to come on level terms before taking the match to the tie-break. In the tie break, the experience of Zib proved more productive for a 4-1 lead before winning it 7-4. In Moya's match, there was enough indications that the defending champion had to sweat it out as his rival never relented from his counter attacks. In the first set, which witnessed the rivals breaking each other to be on level at 1-1, Moya had three winners as compared to Mathieu's nine but the latter had eleven unforced errors to the Spaniard's ten. 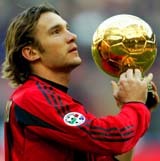 However, Moya dished out champion stuff with some intelligent game plan showing his superior ball play. His passing shots close to the line on both ends during rallies were mostly winners. Coming up with eleven aces compared to just one by his rival Moya held on to the momentum to the liking of his fans. Paes said his prediction for a successful 2005 was based on his assessment of winning two important doubles matches in the ongoing ATP Tour Chennai Open, one of the Masters Series in the world, and also a tour title last year with Zimonjic. 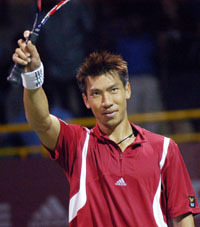 "I am confident of winning as many tour titles and Grand Slams with Zimo. I have assessed him to be one of the best talents in the circuit now. Of course, it will take a month or two for us to override others to be world beaters,"he said. The Slovak Republic reached the final of the Hopman Cup mixed teams tennis tournament against Argentina here today, denying the USA any chance of a third straight win in the event. The third-seeded Slovaks scored a 3-0 walkover against the Netherlands after Peter Wessels was forced to forfeit his rubber against Dominik Hrbaty while trailing 5-2 in the first set. Wessels was hit by the recurrence of a chest muscle injury which he first suffered during his win over Australian Mark Philippoussis on Wednesday and could not return for the mixed doubles. Daniela Hantuchova had earlier given the Slovaks a 1-0 lead when she downed Michaella Krajicek 6-4, 6-2. Argentina, the fourth seeds, were also handed a berth in the final when they scored a 3-0 walkover win against Germany yesterday. Former world number two Tommy Haas was forced out of the tie against Guillermo Coria midway through the second set after winning the first 7-5. The matches will be held from Thursday to Sunday. On other days of the first week, Maratha Warriors will take on Chennai Veerans, Bangalore Hi-Fliers meet Sher-e-Jallandhar, Chennai Veerans clash against Bangalore Hi-Fliers on subsequent days up to January 16. There will be no matches between January 17 and 19, January 22 and 25, January 31 and February 2, and February 7 and 9. Maratha Warriors vs Hyderabad Sultans, Chennai Veerans vs Sher-e-Jallandhar, Sher e-Jallandhar vs Maratha Warriors and Hyderabad Sultans vs Bangalore Hi-Fliers; Hyderabad Sultans vs Bangalore Hi-Fliers, Bangalore Hi-Fliers vs Maratha Warriors, Chennai Veerans vs Hyderabad Sultans and Hyderabad Sultans vs Maratha Warriors; Hyderabad Sultans vs Chennai Veerans, Sher-e-Jallandhar vs Bangalore Hi-Fliers, Chennai Veerans vs Maratha Warriors and Maratha Warriors vs Sher-e- Jallandhar; Hyderabad Sultans vs Sher-e-Jallandhar; Maratha Warriors vs Bangalore Hi-Fliers, Chennai Veerans vs Sher-e-Jallandhar and Bangalore Hi-Fliers vs Chennai Veerans. All matches will begin at 8 p m and will be telecast live by ESPN Star Sports. Pillay said though he was upset with the Indian Hockey Federation (IHF) for the way they treated him during and after the Athens Olympics, he wanted to play as whatever he had achieved so far was because of hockey. The ace forward, who has represented India in four Olympic Games, said he was ready to play in the tournament, starting on January 13, under anyone as he has no ego problems playing under juniors like he had done in the last two Olympic Games at Sydney, 2000 and Athens, 2004. "I will play the Premier Hockey League because hockey is bigger than the players. Whatever I am today is because of this great game," Pillay stated in a signed media statement released here. "I am playing the PHL for tsunami-affected familiies and whatever money I will earn from the league will be donated to the Prime Minister's Relief Fund," the 36-year-old, who is to play for Maratha Warriors team under Viren Rasquinha, said. "I was very upset with the Indian Hockey Federation for the way they treated me during and after the Athens Olympics. I am playing because hockey will be hurt if I stay away from the game due to differences with people in the administration," Pillay said. Pillay said he wanted the media to focus its attention on the younger players as he had been suggesting in the past. "I had publicly stated before and continue to repeat that media attention should go to youngsters who are the future of Indian bockey. "Having played with many of the juniors and trained alongside them in camps, I am confident that these talented, exciting players will prove themselves against foreign professionals in the PHL," Pillay concluded. A total of 13 foreign players, including ace drag flicker Sohail Abbas of Pakistan, will take part in the PHL which is to be played at Hyderabad's Gachibowli hockey complex while two more overseas players are likely to add to the glamour. After heated exchanges between the ad-hoc committee lawyer Nayna Sarraf and Rungta's counsel Paras Kuhad, the court granted the status-quo order giving the ad-hoc committee time till Monday to file a reply. Earlier, the government appointed ad-hoc committee had superceded the Executive Committee of the RCA. The ad-hoc body had started functioning and had even withdrawn money from the RCA accounts. Mr Rungta challenged the appointment of the ad-hoc body and said that it was unlawful to appoint the body without proper notice. The other 10 one-day matches will also be held at Una and Dharamsala on the same dates. The Amtar ground of the Nadaun town located on the left bank of mighty Beas river in the district is getting ready for the five one dayers slated for January 9,11,13,15 and 17 in which top North Zone Indian players like Virendra Sehwag, Gautam Gambhir, Harbhajan Singh, Ashish Nehra, Dinesh Mongia and Sarandeep Singh will be seen in action. It is for the first time that such big matches would be played at the Amtar ground of Nadaun. Himachal Pradesh will play there first match at Nadaun on January 9. In second match on January 11, Himachal will face Haryana followed by Himachal. The teams from Haryana and Jammu and Kashmir will also play here on January 17. Necessary arrangements for all the five matches have been completed and a team of the district cricket association is camping at the Amtar ground giving final touches to the ground. President of the Himachal Pradesh Cricket Association, Anurag Thakur is happy that Hamirpur would also get its share of cricket. Mr Thakur told The tribune today that it would be for the first time that Amtar ground of the historic town of Nadaun had been chose as one of the three venues of the state for hosting the matches. He said that five matches would be played on the two newly laid pitches. He said that the lush green pitches of Amtar ground would help the batsmen and bowlers both. He revealed that arrangements for the stay of the participating teams had been completed. He said that these teams would stay in the government and private hotels at the world famous shrine of Ma Jawalamukhi, about 12 km from Nadaun. With an aim to produce better results in the next Asian Games and the Olympic Games, it has been decided to admit 20 meritorious players each in wrestling, hockey and athletics in the Speed Fund Academy at Ludhiana. Players in the age group of 18-25, who have played in the nationals, are eligible for admission. They will be provided diet money of Rs 150 daily, besides medical facilities and kit to participate in national and international competitions. The admitted players will have to achieve the targets set for them and the coaches appointed will be rewarded if they show the desired results. The State Games for men will be conducted at Jalandhar in the last week of January in which more than 1,500 players from all districts of Punjab will participate. To raise the standard of sports in the state, the Sports Department organised several events during 2004, including the first Indo-Pak Punjab Games and the international marathon from Chamkaur Sahib to Fatehgarh Sahib. After 10 years, a summer coaching camp for Punjab players was conducted at Nauni (Solan) from June 16, 2004 to July 1, 2004, in which 117 sportspersons took part. The government has also increased the diet money of players from Rs 50 to Rs 75 (seniors), for juniors from Rs 40 to Rs 60 and for local players from Rs 20 to Rs 30. In second position was the duo of A.S. Lehal and Chirag Kumar with an identical three-over 283 as their four-day tally. One stroke behind was Manav Das who finished third courtesy a superb final round of four-under 66. Bhullar, who climbs to the top of the Royal Challenge Indian Golf Tours Order of Merit after this win, started his round today with a birdie. However, his front nine journey ended on a rather disappointing note when he recorded a double bogey on the ninth hole. In this particular hole, after his second shot landed just short of the green, the Kapurthala lad failed to sink a simple four-feet bogey putt and consequently added two strokes to his scorecard. The return journey began with a string of pars but only till the 15th hole where he scored his first bogey of the day. With the same result on the next two holes as well, Bhullar looked to record his worse round of this event. However the final hole saw some good club work by the winner as he made his second birdie of the day. This is Bhullar’s second win on the Royal Challenge Indian Golf Tour and he was ecstatic with his performance. “I am delighted with the way I played in this tournament. The support that the amateur circuit has received from Royal Challenge has acted as a great motivator for all of us”. Chirag Kumar, who won the RCGC Cup in Kolkata last month, crept up the leaderboard to finish joint second with a final day performance of one-under 69. His round today consisted of three birdies which came on the third, fourth and 18th holes. He recorded two bogeys, one of which came on the 11th hole, while the other came on the 17th. 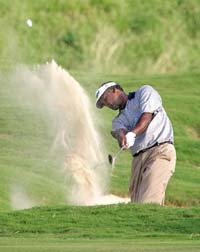 Sharing second place honours with him was A.S. Lehal who made three birdies and an equal number of bogeys in his round. His scorecard was marred by a double bogey which he recorded on the 14th hole. The game between Sasikiran and Laxman was fought closely and both players had their chances to consolidate the position, but Laxman wasted his fine openings and Sasikiran sewed up the match in 66 moves. In the second board game between Pune-based Grandmaster Abhijit Kunte and DV Prasad, Kunte applied constant pressure, and Prasad was caught in time pressure to lose the contest in 54 moves. Another Grandmaster, R B Ramesh, came back to score a quick victory over International Master V Koshy. Ramesh took the initiative early, and clinched the game in 26 moves. Four more rounds remain in the tournament. In other matches, N Sanjay drew with Anton Filippov, Dmitry Kayumov drew with MB Muralidharan, Enamul Hossain beat Holmirzaev Bahodir and R Preetham Sharma lost to Deep Sengupta. Giving this information here today, Mr Naresh Khanna, Secretary (North Zone) of the Himachal Pradesh Football Association said that Uttar Pradesh, Uttaranchal, Haryana and Himachal Pradesh would participate in the championship. The selection of players for Himachal Pradesh state football team for this championship would be made at Chamba on January 10, Mr Khanna said, adding that only those players who were born in and after 1986 were eligible to take part in the selection meet. Mr Khanna further informed that the selected state team of Himachal Pradesh would be given a 10-day training to prepare for the national championship under the supervision of football coach Prem Bhushan Hiteshi.